A reading of Blackjack: The Thief of Possession, a comedy by Rosary Hartel O'Neill, will be presented at the National Arts Club on Monday, April 26, 2010, at 8:00 PM. O'Neill is a VCCA Fellow and playwright-in-residence at the National Arts Club (NAC). The production is presented by the President, Board of Governors and Theatre/Drama Committee of the National Arts Club, and starts NAC Governor Jo Anne Brown. The NAC is located at 15 Gramercy Park South in New York City. 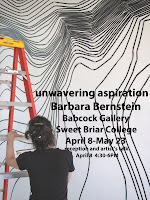 Join us Thursday, April 8, from 4:30-6 pm at Sweet Briar College's Babcock Gallery for the opening of unwavering aspiration, a site-specific installation by VCCA Resident Artist and Fellow Barbara Bernstein based on research of the topographical maps of the college campus. The show will be open until May 29.